Today, I challenge everyone to go to an ATM machine and tape some money. It can be any amount, but just a small act of kindness to share with someone. How many of you have ever went to the ATM knowing you didn’t have much you could withdraw, but you needed it? Imagine what a blessing this could turn into. Again, no amount is too small!! We always pray that God picks the “perfect” person to receive the gift and that they would be blessed by it. I taped a 365 Days of Kindness card inside so the person receiving it can pass it on – (YOU CAN PRINT THE CARDS BY CLICKING HERE). The purpose of printing the cards is that the recipient can then recycle it and pass the card on by doing another random act of kindness. My vision is that this will continue and continue until EVERYONE is involved in some capacity. Who’s in? I am praying that everyone gets involved in this. None of us can help everyone, but all of us can help someone, and when we do we serve Jesus. We can make an impact in our communities, one life at a time!! 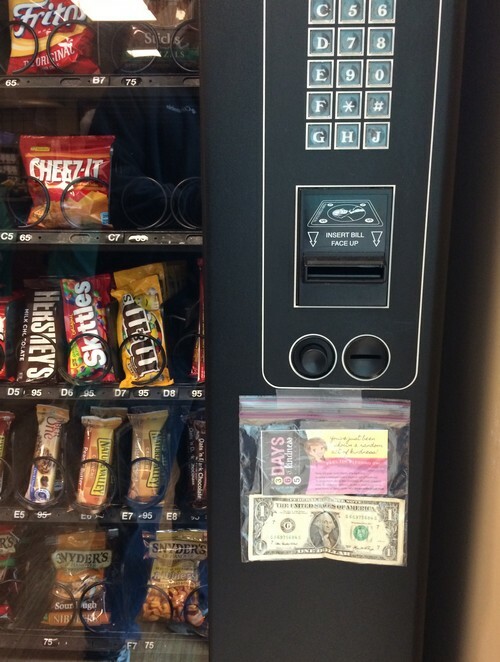 Today, I challenge everyone to go to a vending machine and place some money in a baggie. This is such an easy one to do and could be a huge blessing to someone. We did this at a hospital emergency room. We also attached the FREE Act of Kindness Cards that (YOU CAN PRINT BY CLICKING HERE). 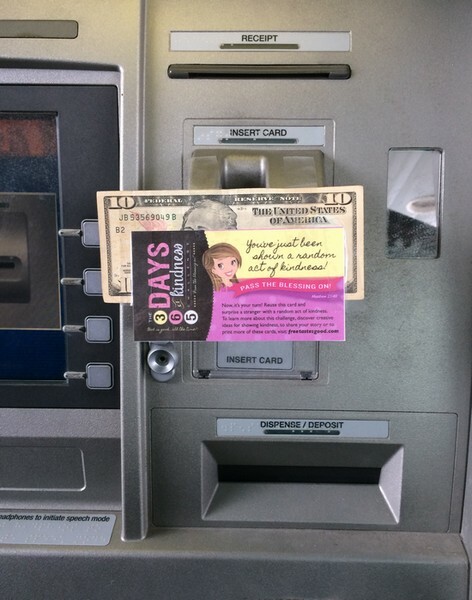 The purpose of printing the cards is that the recipient can then recycle it and pass the card on by doing another random act of kindness. My vision is that this will continue and continue until EVERYONE is involved in some capacity. Who’s in? I am praying that everyone gets involved in this. None of us can help everyone, but all of us can help someone, and when we do we serve Jesus. We can make an impact in our communities, one life at a time!! If you want to share you random acts of Kindness stories or see the random act of Kindness list that we have completed, CLICK HERE! This is our fourth year doing the 365 Days of Kindness and there are so many AMAZING stories. If you would like to share your story, GO HERE!! It is so encouraging and exciting to watch God at work. THANK YOU JESUS!! Today, I challenge everyone to go into a public restroom and place a packet of baby wipes on the baby changer. This is such an easy task to do and could be a huge blessing to a parent. 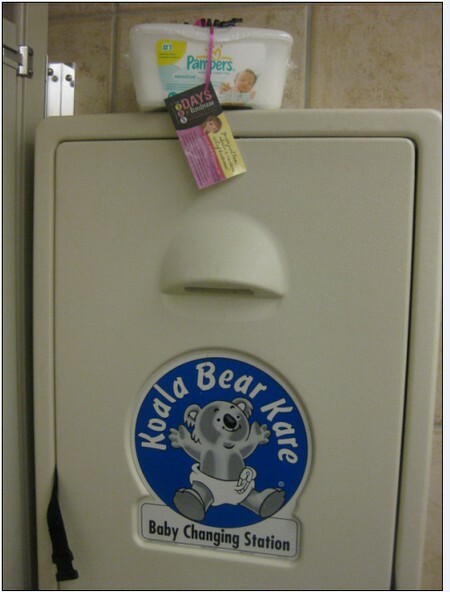 I remember so many times when I had small children forgetting my baby wipes. It may seem like a small act, but could impact someone’s life tremendously. In the last month or so we have had many opportunities to pick up FREE/CHEAP baby wipes. I also attached a 365 Days of Kindness card. (YOU CAN PRINT THE CARDS BY CLICKING HERE). The object of this is that they will receive it and use the card to do another act of kindness. None of us can help everyone, but all of us can help someone, and when we do we serve Jesus and lives can be changed by small acts of kindness!! It is such a cool way to show the love of Jesus. So many AMAZING stories from the 365 Days of Kindness from last year and so far this year! If you would like to share your story, GO HERE!! It is so encouraging and exciting to watch God at work. THANK YOU JESUS!! 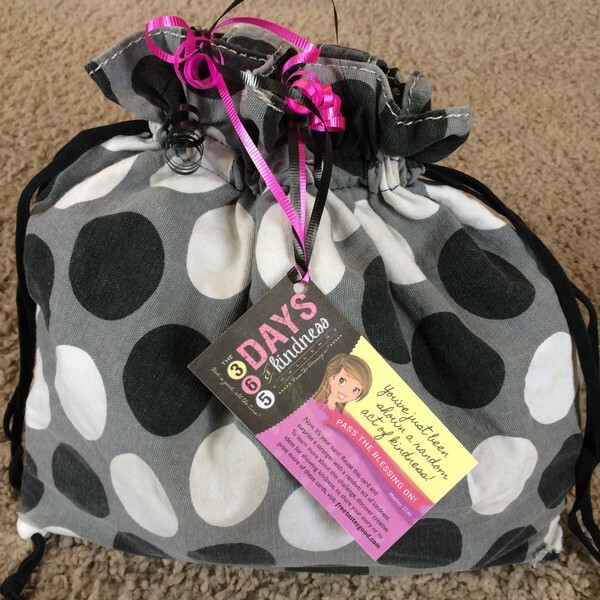 Today, I challenge everyone to make up a care package and put it all in an old purse and hand out to a homeless person. I enclosed all the essential items including feminine care products, a scarf, and a warm pair of socks and gloves. 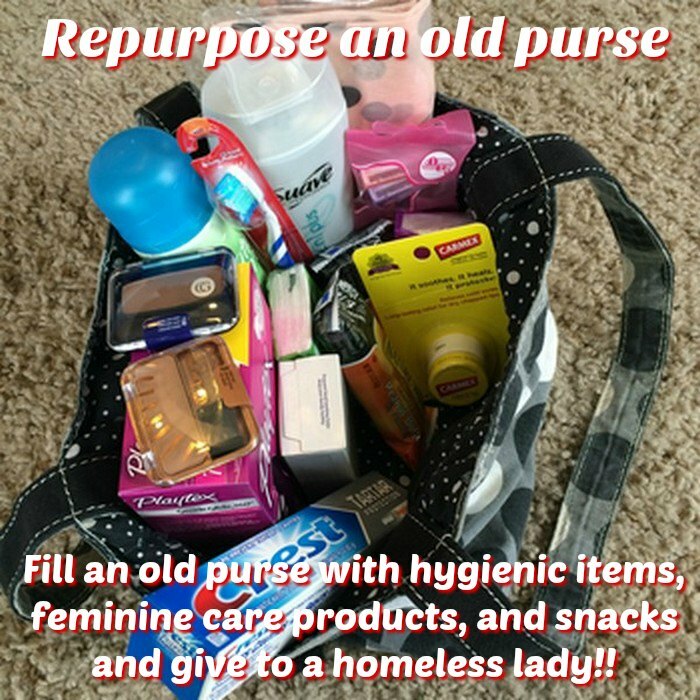 You can put whatever you want in it, but what a great way to repurpose our old purses while blessing someone else. Most of these items we can get for FREE/cheap with our coupons so an easy way to bless someone 🙂 We attached a 365 Days of Kindness card so the person receiving it can pass it on – (YOU CAN PRINT THE CARDS BY CLICKING HERE). It is small act, but could be a Huge blessing to someone! The purpose of printing the cards is that the recipient can then recycle it and pass the card on by doing another random act of kindness. My vision is that this will continue and continue until EVERYONE is involved in some capacity. Who’s in? I am praying that everyone gets involved in this. None of us can help everyone, but all of us can help someone, and when we do we serve Jesus. We can make an impact in our communities, one life at a time!! 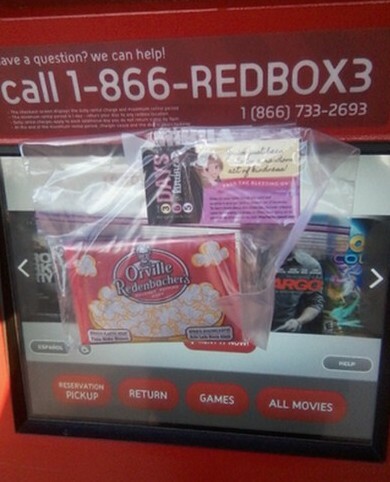 Today, I challenge everyone to find a red box and tape some microwavable popcorn and $1. We have had an amazing sale on Pop Secret at Kroger these last two weeks so it is an easy way to “surprise” someone with an unexpected blessing. Make sure to attach a card (YOU CAN PRINT THE CARDS ABOVE BY CLICKING HERE IF YOU’D LIKE). They say, “Please recycle this card and pass it on!” The hope is the recipient will then use the card to pass the blessing on to someone else and it will continue and NEVER end. Who’s in? I am praying that everyone gets involved in this. None of us can help everyone, but all of us can help someone, and when we do we serve Jesus. We can make an impact in our communities, one life at a time!! 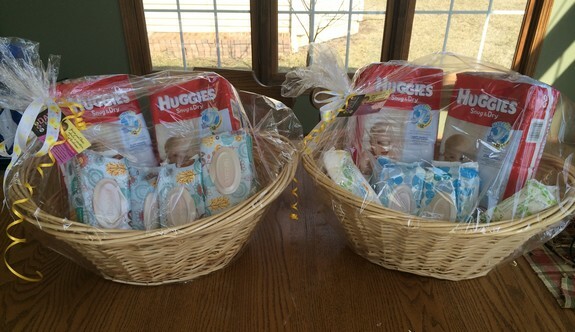 Today, I challenge everyone to make up Baby Blessing Baskets and take to a Pregnancy Center. 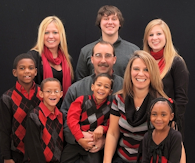 We are taking ours to Heartbeat of Toledo and the Pregnancy Center of Greater Toledo to bless a few moms. So may women are struggling with their pregnancies because they are alone and this is such an easy way to show them the love of Christ. If you have a Krogers nearby, you know the Huggies and baby wipes had some amazing deals and still do this week, plus Huggies are a moneymaker at Rite Aid this week (1/10 thru 1/16) so it was an easy blessing. Even if you can only afford one package of wipes, that is an unexpected blessing to a mom. We attached a 365 Days of Kindness card so the person receiving it can pass it on – (YOU CAN PRINT THE CARDS BY CLICKING HERE). It is small act, but could be a Huge blessing to someone! The purpose of printing the cards is that the recipient can then recycle it and pass the card on by doing another random act of kindness. My vision is that this will continue and continue until EVERYONE is involved in some capacity. Who’s in? I am praying that everyone gets involved in this. None of us can help everyone, but all of us can help someone, and when we do we serve Jesus. We can make an impact in our communities, one life at a time!! 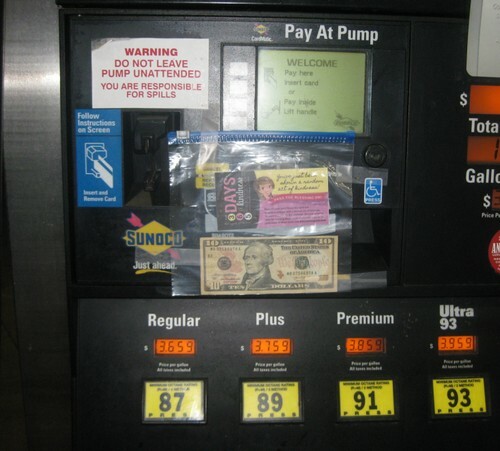 Today, I challenge everyone to find a gas station and tape some money to the pump. Think how blessed someone will feel to find this small blessing 🙂 Remember no amount is to small or too big when we put it in God’s hands. We also attached the FREE Act of Kindness Cards that (YOU CAN PRINT BY CLICKING HERE). The purpose of printing the cards is that the recipient can then recycle it and pass the card on by doing another random act of kindness. My vision is that this will continue and continue until EVERYONE is involved in some capacity. Who’s in? I am praying that everyone gets involved in this. None of us can help everyone, but all of us can help someone, and when we do we serve Jesus. We can make an impact in our communities, one life at a time!! 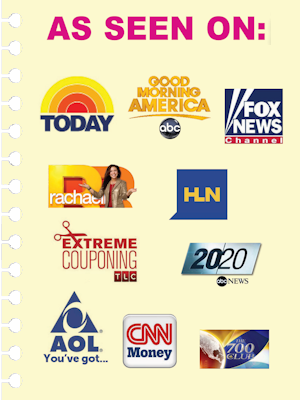 Today, I challenge everyone to go to the post office and tape a stamp or a book of stamps to the self-serve station. Such a small act of kindness to share with someone, but could truly bless them more than we even know. Again, no amount is too small!! We always pray that God picks the “perfect” person to receive the gift and that they would be blessed by it. I taped a 365 Days of Kindness card inside so the person receiving it can pass it on – (YOU CAN PRINT THE CARDS BY CLICKING HERE). The purpose of printing the cards is that the recipient can then recycle it and pass the card on by doing another random act of kindness. My vision is that this will continue and continue until EVERYONE is involved in some capacity. Who’s in? I am praying that everyone gets involved in this. None of us can help everyone, but all of us can help someone, and when we do we serve Jesus. We can make an impact in our communities, one life at a time!! Many of you have probably seen this on FB recently, but I thought it would be a cool way to add to our 365 Days of Kindness. 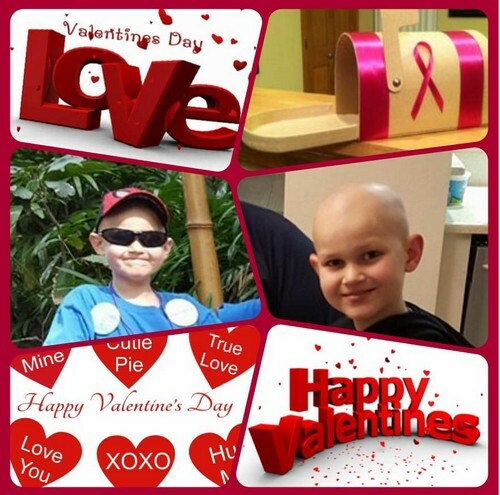 I’ve talked with Jeff and Janey and we want to do something fun for Dane for Valentine’s Day to help him remember how much we all love him❤ Dane has cancer (Osteosarcoma) and we are going to do a card drive for him. Today is 1-14-16 so we all have exactly one month to buy a card, to make a card, to help collect cards to give to Dane. Please share this and spread the word let’s fill the Liberty Center post office with cards for Dane, and let’s make cards in our home and in our churches, in our classrooms at school and make this really fun! 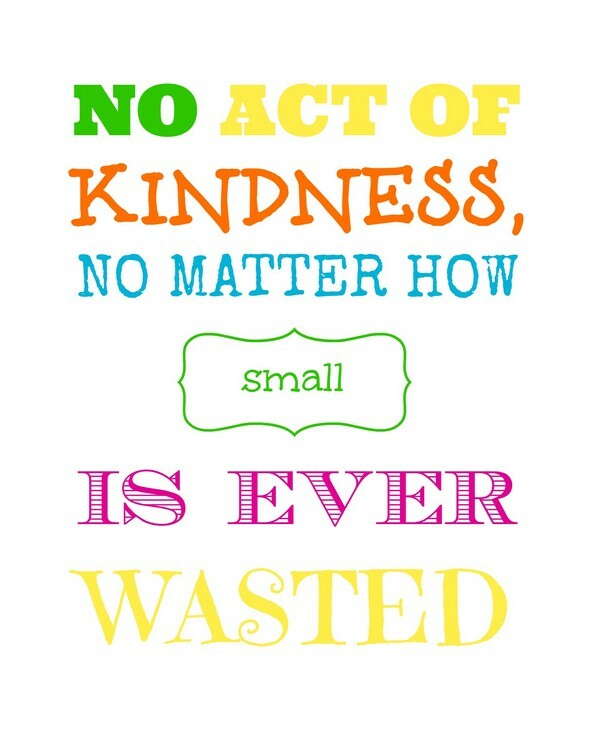 You can also attach the FREE Act of Kindness Cards that (YOU CAN PRINT BY CLICKING HERE). 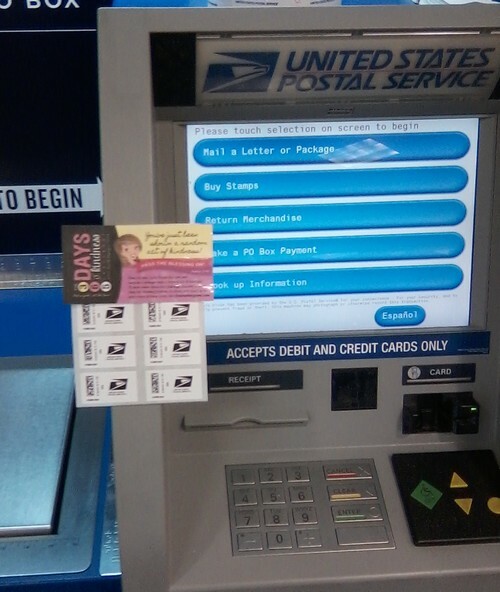 The purpose of printing the cards is that the recipient can then recycle it and pass the card on by doing another random act of kindness. My vision is that this will continue and continue until EVERYONE is involved in some capacity. Who’s in? I am praying that everyone gets involved in this. None of us can help everyone, but all of us can help someone, and when we do we serve Jesus. We can make an impact in our communities, one life at a time!! A few years ago we did this fun band-aid drive and we are doing it again this year in memory of my nephew, Troy, who died of Leukemia at the age of 12 – 16 years ago. My kids decided this would be so fun to do in Troy’s memory. Today, I challenge everyone to purchase a box of fun Band-Aids for a great cause. 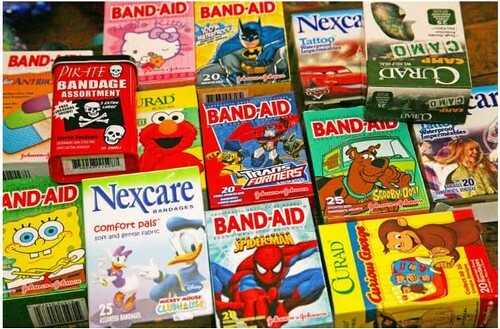 Our kids are collecting boxes of fun band-aids (Hello Kitty, Scooby Doo, sparkles, etc) to be delivered to St. Vincent Mercy Medical Center Children’s Oncology Department. We are trying to get 1000 boxes and at least 1 box from every state and would love to see some sent internationally 🙂 Now I know we have followers from the blog and FB page from EVERY state). How much fun will this be to follow – our kids will keep a map. Band-aids can me mailed to Troy’s Band-Aid Drive, C/O Free Tastes Good, P.O. Box 312, Sylvania, OH 43560. 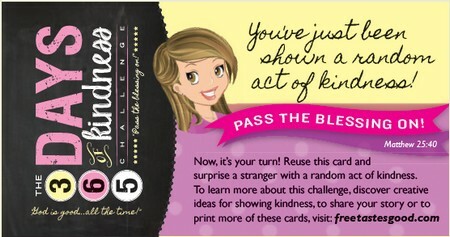 You can also attach the FREE Act of Kindness Cards that (YOU CAN PRINT BY CLICKING HERE). The purpose of printing the cards is that the recipient can then recycle it and pass the card on by doing another random act of kindness. My vision is that this will continue and continue until EVERYONE is involved in some capacity. Who’s in? I am praying that everyone gets involved in this. None of us can help everyone, but all of us can help someone, and when we do we serve Jesus. We can make an impact in our communities, one life at a time! !